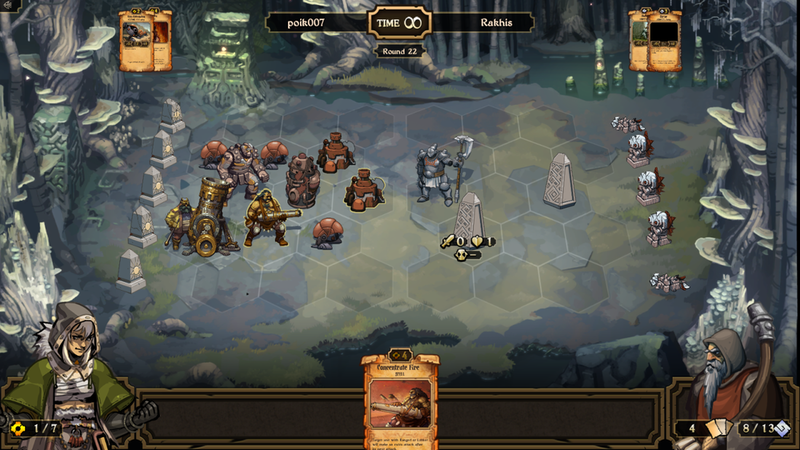 Scrolls is a collectible card game that follows the line of Magic The Gathering an mixes it a bit with figurine-based games to create an easy to understand blend of strategy and luck. It's interesting and some of the mechanics are changes that I like about the TCG genre but after playing it a bunch, I can't say I'm interested to play much more. Like in Marvel Heroes last week, the first thing you see when you start the game is a choice between what deck you want to use. No tutorial, no explanations of everything you need to know about the game, only these three decks and a little bit of text to help you make your decision. Why not show the tutorial before that step? I knew nothing about the game making that choice, and it felt dumb. There are three type of cards in Scrolls; Energy, Growth and Order. If you've played Magic The Gathering, it's basically Red, Green and White. Having that knowledge helped me pick one, but for someone who never played TCGs, this would be confusing and the choice would almost be random. If you want to buy other decks, it'll cost you 6000 gold (or 5$, because you can buy premium money in a game that's already 20$) and you can buy random card packs or avatars if you so desire. Money seems to come slowly, about 250 gold per game, and you don't get cards from other means than buying them. I'm not saying that the game forces you to pay real money to enjoy it, but I didn't get new cards often and I bought the 1000 gold pack with at least one rare card. This is like other TCGs, random boosters where you almost never get what you want. Why isn't there a library of all cards that I can browse in-game? Maybe buy them one at a time for premium prices? You start with seven cards and five 'idols' with 10 hit points each. The goal of the game is to destroy your opponent's idols that are on their side of the board. Once per turn, you can sacrifice a card to either raise your resources by 1 (all cards need a certain number of resources to be played) or to draw two cards. Creatures have attack, health and cooldown, which goes down by 1 each turn and when it's equal to zero, that creature attacks the row it's on (some creatures attack randomly on the board, but most of them go in a straight line). It's a bit different from Magic: The Gathering and I like it. I love that all cards can be used for resources because you don't have to manage that aspect in addition to offense and defense. There are plenty of cards and effects in Scrolls and some systems should be more player friendly for the first few games. Some of your creatures can use special effects instead of attacking, I'd love a toggle to warn me that I forgot to use them. You can still attack in the row of destroyed idols for no effect, I'd like a warning that my creature is going to hit thin air. You can move your units around, enchant them, use direct damage cards, it's all stuff I already know, but the grid structure makes it more interesting. You couldn't have cooldowns in Magic The Gathering because then you'd need to place counters on all your cards. Same thing for health, in Magic, creatures heal at the end of each turn, in Scrolls their health stays as-is (and you can't see their maximum health at a glance, that'd be nice ) so this is another thing that only works in computer games, and Scrolls does it well. Scrolls is perfectly competent TCG with some micro-transaction features that you could entirely leave out if you're not in a hurry to get all the cards you'd need to make your dream deck. Having figurines of creatures to move around adds a layer of strategy over the basic card game concept and having it entirely on computers adds some interesting mechanics that wouldn't work well otherwise. The trials are pretty neat as they pit you in battles with special conditions such as idols having lower hit points than the usual and the enemy starting with some creatures on their side of the field and they reward a bit of extra gold while teaching you how to handle certain situations with your deck of choice. 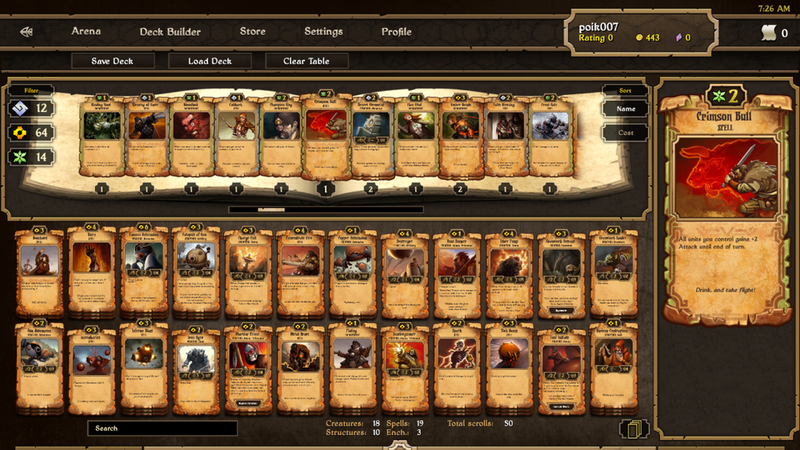 I'm not into competitive card games so that'll be enough for me, but I might come back to Scrolls from time to time.